In May of 1989, five individuals set out to form a band with intentions of creating extreme and aggressive music. 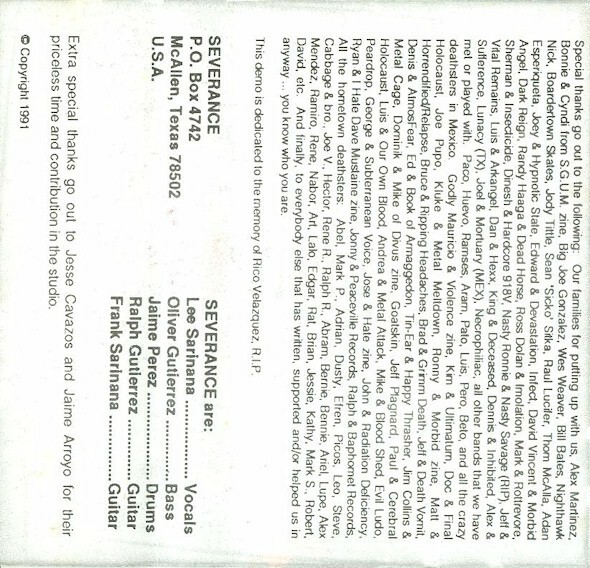 Frank Sariñana, Lee Sariñana, Oliver Gutierrez, Ralph Gutierrez and Jaime Perez were collectively known as Severance. In 1990 the PROCREATION" REHEARSAL DEMO was recorded in the living room of a friend's house. It was recorded on a four-track mixer and came out pretty decent. Several hundred were sold and even more were acquired through tape trading. In 1991 they recorded "AFTERBIRTH OF INFAMY". This release was their first studio effort. It was an extension of our rehearsal demo. This five-song demo continued to gain Severance world wide recognition which ultimately led to a recording deal with Drowned Productions in Spain. 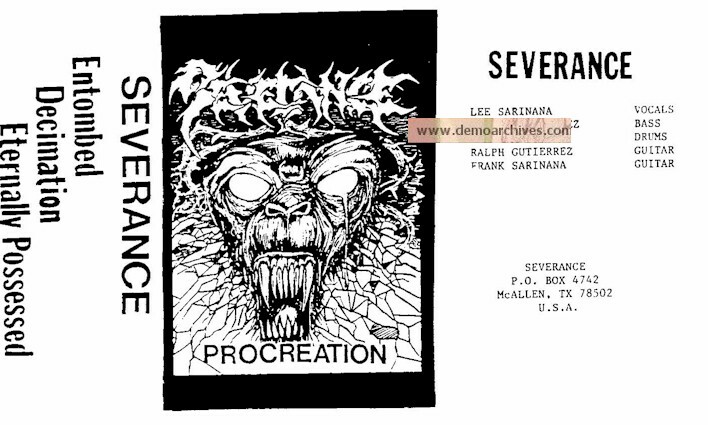 Severance recorded two new songs for a 7" record to be financed and distributed through Drowned Productions. Because of multiple line-up changes, it would be 4 years before our next release. This leads us to the self-financed, 4-song CD, Salvation Denied. This release contained all new material and the global notoriety continued. Only 576 copies of this disc were pressed, and they were all sold through various distributors as well as through the band. Pro printed covers. Recorded onto regular tapes. No lyrics. Pro printed covers. Recorded onto studio tapes with stickers on the shell. No lyrics.